Every girl needs a vacation and we know how important quality time with your bestie is – but a little adventure and pampering never hurt either! Here at the Portola Hotel & Spa, we have designed some fun specials and packages, ideal for your next girl’s getaway! Pick from a day trip or a weekend getaway – add in hikes among the hills of Carmel Valley or Big Sur, walking or biking along the Coastal Recreation Trail, shopping in Carmel-By-the-Sea, lounging by the pool (with cocktails of course) or a boutique wine tasting tour– the possibilities are endless! Our award-winning, on site, Spa on the Plaza and Monterey’s newest restaurant, Jacks Monterey have partnered to offer the ultimate spa day. Soothe your spirit and invigorate your whole body with a 50-minute Aromatherapy Massage for two at Spa on the Plaza. After your massage, enjoy California Coastal Cuisine created by the freshest local ingredients sourced from Monterey County, at Jacks Monterey located inside the Portola Lunch includes two entrees from Jacks Monterey’s lunch menu, available until 3:00pm. To book, call the Spa on the Plaza at (831) 647-9000. Complimentary self or valet parking available at the Portola Hotel. Relax, rejuvenate and brunch! Enjoy a 50-minute Aromatherapy Massage for two at Spa on the Plaza, then indulge in a lavish brunch at The Club Room inside the Portola. Treat yourself and your BFF to a European style breakfast buffet including: made to order omelets, house made pastries, fresh fruit, bottomless mimosas and more! Because brunch is always a good idea, especially with good friends; enjoy live music, amazing food and morning cocktails at Jacks Monterey! 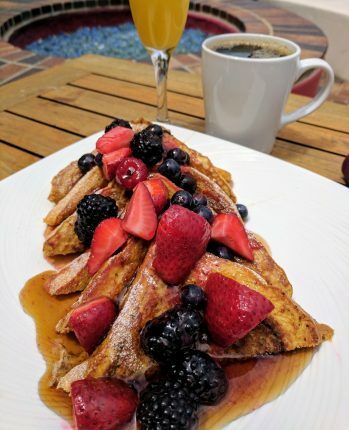 Sunday morning favorites include: Ricotta Cheese Blintzes, California Benedicts, Carl’s Skillet Fried Chicken and Waffles, Brioche French Toast and more. In addition to Executive Chef Danny Abbruzzese’ s sustainably sourced menu splurge with a cocktail or two from Jacks Grande Rolling Beverage Cart serving up Bloody Mary’s, Mimosas, Screwdrivers, and more! To reserve a table, call (831) 649-7830. Complimentary self or valet parking available at the Portola Hotel. Raise a glass and experience all the Monterey Bay has to offer with a one-night stay at the Portola Hotel paired with Monterey’s original craft brewery, Peter B’s Brewpub. Located behind the Portola, Peter B’s serves a variety of award-winning craft beers brewed on-site along with delicious pub food including nachos, wings, and beer battered fish and chips. 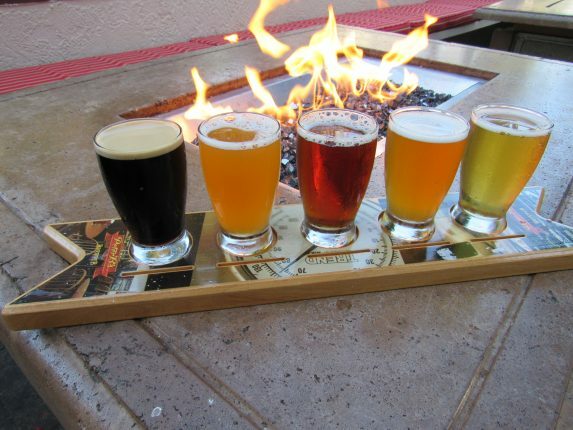 With this package, you’ll receive two beer flights and a Chef’s choice appetizer! Click HERE to book! 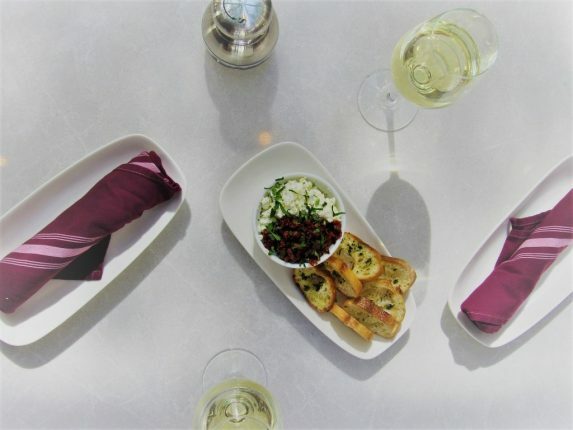 Start your Girls Getaway off with two glasses of wine paired with Jacks Monterey’s Harley Farm Goat Cheese appetizer served warm, with olives, sun-dried tomatoes, and a toasted baguette. Dine under the trees in Jacks atrium or relax next to the fireplace with your wine in Jacks’ coastal inspired bar. Portola’s Wine & Dine Getaway includes a well-appointed guest room and your choice of city, garden terrace or ocean views. Click HERE to book! Girls Trips, Spa Days and Mimosas go hand in hand! Start your getaway by relaxing at Spa on the Plaza with a 50-minute Symphony massage for two. End this perfect spa-day by revitalizing your mind and body with a complimentary steam shower and access to other Spa amenities. Spend the night in one of the Portola Hotel’s nautically inspired guestrooms and get the most out of your stay with breakfast for two at The Club Room including Bottomless Mimosas! Click HERE to book!